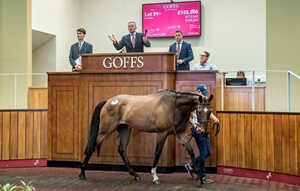 View the results >> A pair of six-figure sales headlined a strong renewal of the Goffs UK August Sale at Doncaster today with the 297 horses catalogued attracting buyers from throughout Europe and the Middle East. High demand in the ring drove the sale average up 40% to £11,560, the median up 44% to £7,200 while the clearance rate finished at a strong 80%. Today’s trade was topped by Raheen Stud’s Amschel (Lot 91), a 4YO son of Nathaniel who has won three of his four Hurdle starts, who was knocked down to Harold Kirk on behalf of Paul Byrne for £155,000 with Roger Brookhouse the underbidder. John Gosden’s smart 3YO Hasanoanda (Lot 188), who won over 10 furlongs since the catalogue went to print, was also in demand with Tom Malone going to £115,000 to secure the gelding. For the first time the sale also offered horses in a Select P2P/Form Horse Session which was topped by Colin Bowe’s debut winning Pointer The Con Man (Lot 89) who sold to Donald McCain and Derek O’Connor for £70,000. “We have enjoyed a very good day in the sale ring. We catalogued some high-class horses and to sell two for six-figure prices is very pleasing and shows yet again that Doncaster Horses-in-Training Sales deliver the results when we are entrusted with the horses.